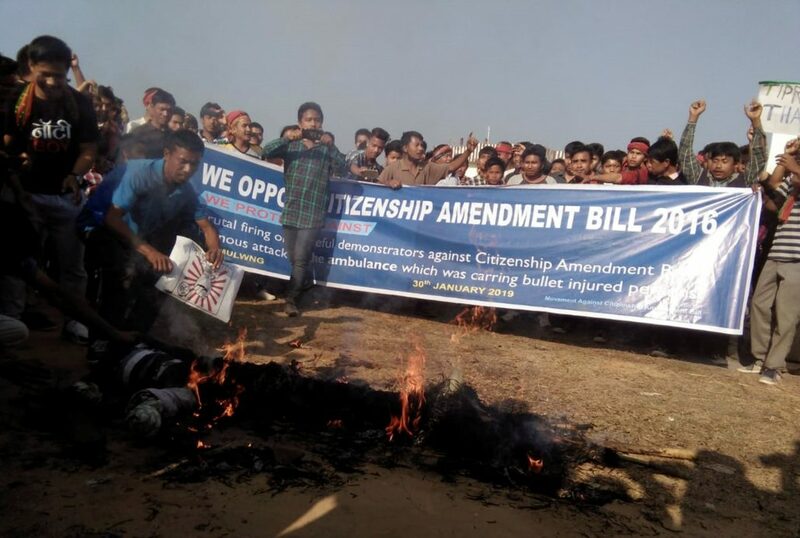 Non-Left tribal parties in Tripura stage protest against Citizenship Bill 2016. Image: Northeast Now. Non-Left opposition tribal parties in Tripura jointly protested at Khumulung, TTAADC headquarters against the Citizenship Amendment Bill. This is the first time all non-BJP and non-CPI (M) parties are taking part in a political programme together on the issue of Citizenship Amendment Bill 2016, already passed by the Lok Sabha. As part of the protest, a mega procession started from Dasharambari area in Jirania sub-division in which thousands of tribals took part as they raised ‘Bangladeshi go back’ slogans. The procession was led by Tripura PCC working president Pradyut Kishore Debbarman, INPT president Bijay Kumar Hrangkhawal, general secretary Jagadish Debbarma, former ATTF supremo Ranjit Debbarma, former MLA Rajeshwar Debbarma, Tipraha leader Ramani Debbarma, and NCT president and former MLA Animesh Debbarma. Half a dozen tribal political parties and tribal leaders of national political parties took part in the protest which did not have any party flag, symbol or festoons. Protesters also burned down an effigy of Prime Minister Narendra Modi. The Congress ST cell also took part in the programme, however, official IPFT partner in the state’s coalition government, though stayed away from the protest, Mebar Kumar Jamatya, IPFT secretary and Tribal Welfare Minister, is currently in Guwahati to take part in the conclave of all tribal based regional parties against the Citizenship Amendment Bill.